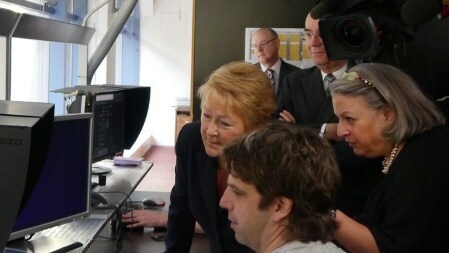 Québec Premier Pauline Marois travelled to the United Kingdon Monday as British digital design and special effects studio Framestore announced it was choosing Montréal as the location of its fourth global office, and its first in Canada. Complementing locations in London, New York and Los Angeles, the Montréal outpost for Framework will be located in de Gaspé, in the heart of the Mile End creative community. Framework said its upcoming visual effects work for the movies RoboCop, All You Need Is Kill and Paddington Bear will all be done in Montreal. The company credited Montreal’s talent base in software, creative and technology markets with the decision to locate in the city, as well as the fiscal advantages of Québec’s Film Tax Credit. Being in the Eastern Time zone will also allow for the working day to cross over from Framestore’s other locations.